Heat gas or charcoal grill. In small bowl, mix seasoned salt, oregano, garlic powder, pepper, paprika and ground red pepper. Brush chicken pieces with oil; sprinkle with seasoning mix. When grill is heated, place chicken on gas grill over medium heat or on charcoal grill over medium coals; cover grill. Cook 35 to 50 minutes, turning occasionally, until thermometer inserted in center of chicken breasts reads 170°F and in center of thighs, legs and wings reads 180°F (move breasts to outer edges of grill when done). 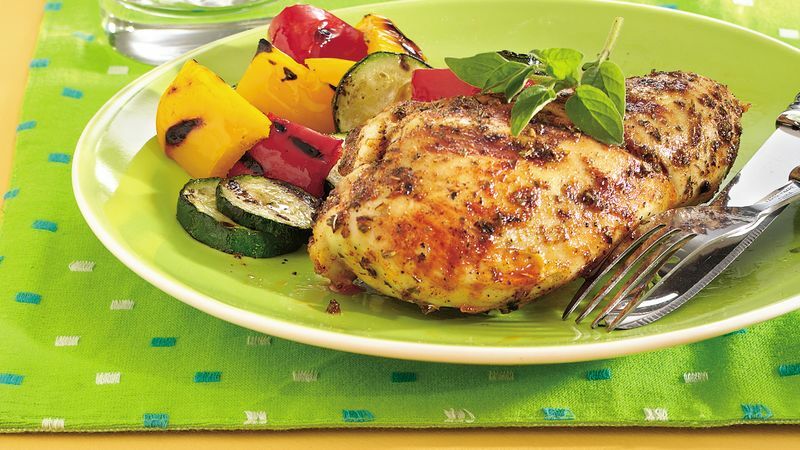 Serve grilled vegetables with the chicken. Toss the cut-up veggies with a teaspoon of olive oil and season them to taste with salt and pepper. Cook them in a grill basket, stirring frequently.